The following advice is aimed at installers with a more advanced knowledge of solar power systems. Click here to view a map of annual solar radiation in South Africa. While the sun may shine throughout the day, not all these hours are giving you 100% sunshine levels. The most efficient sunlight hours are from 9.30 am in the morning until about 3pm in the afternoon. Fortunately South Africa receives some fo the world’s best sunshine and we experience some of the highest levels of solar radiation in the world. The average solar radiation in South Africa varies between 4,5 and 6,5 KWh/m2/day. When calculating sunlight levels, take the different seasons into consideration. 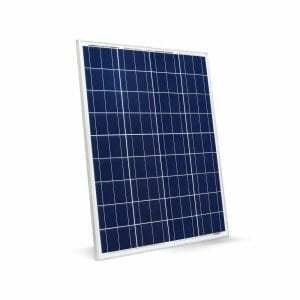 When selecting a site for your solar power panels, be careful to select a site which does not shade the solar panels at any time of the day (don’t forget the the angles of the winter and summer sun are different). Even a small branch from a deciduous tree will substantially reduce power output. Even though the sun may be above the horizon for over ten hours a day, that does not mean you can calculate the power intake from the solar panels at 10 hours. You have to consider the earth’s atmosphere, the angle of the sun in relationship to the solar array and the efficiency of the solar panels. A standard calcualtion factor in ideal circumstances is 5 – 6 hours. To establish your power consumption you can check your electricity bill over the last twelve months, adding all KW/h together and dividing it by 12. This will give you an average figure over the last 12 months and incorporates the difference between winter and summer, or click here to download our APPLIANCE CALCULATOR. which you can also use to help calculate your average power consumption. Remember the more accurate you are with your ratings, the more money you can save, so take a little time to investigate the rating plates on your appliances. Most appliances have their watt, VA, KVA or Amps displayed on a label or in the manual. You must decide what DC voltage and calculate what size batteries you will need (if you were using a grid-tied system you would not need batteries). Battery voltage is difficult to change after your system is built, so choose carefully at the start. If you want a small simple power system of not more then 100 – 200W then 12 volts will probably be the easiest. You can use 12 volt DC directly in very small systems, adding 230 volt AC with a sinewave inverter if necessary. 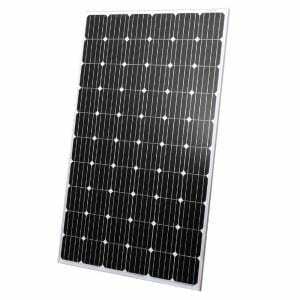 If you think you will have more than 500 watts of solar modules, consider 24 volts. A technical advantage is that 24 volt wires can run longer distances. If you must place solar modules over 30 meters from the house for adequate sun exposure, choose 24 volts or even better, 48 volts. 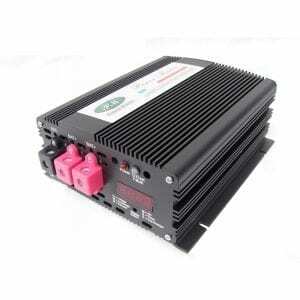 Voltage converters (DC – DC Converters) are available to run 12 volt DC equipment from 24 volt or 48 volt batteries. It is common practice to choose the DC Bus voltage as high as possible and make the DC connection between the solar panels and batteries, and batteries and inverter system, as short as possible. You can then run the AC output of the inverter for 100 – 200m, depending on the cable size, with much less losses than if you had done that with the DC wires. A 48 volt system therefore has greater advantages if a longer wire run between the inverter and the batteries is unavoidable. 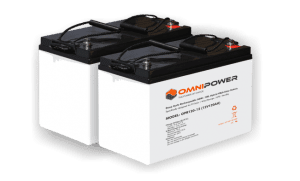 The size of the battery bank required will depend on the storage capacity required, the maximum discharge rate, the maximum charge rate, and the minimum and maximum temperature at which the batteries will be used. When designing a power system, all of these factors are looked at, and the one requiring the largest capacity will dictate battery size. Car batteries are not designed for this application and therefore are not suitable for solar use. 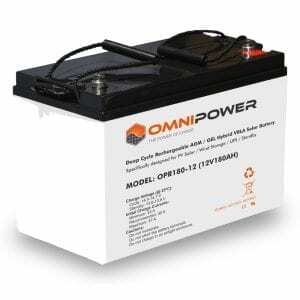 These batteries are ideal for remote, unattended systems as they never need water refilled. They cannot freeze or spill, so they can be mounted in any position. However, they are much more expensive. 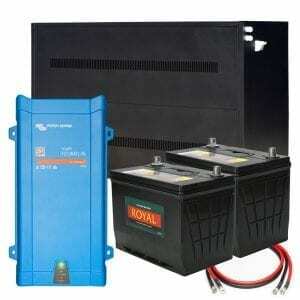 These batteries are primarily used for standby applications. With these batteries great care has to be taken to ensure the battery is not charged above 14.1 volts for a 12 volt battery. Over charging can either shorten the battery life or even damage the battery. Your solar charge regulator must have user adjustable settings to ensure charge voltage does not exceed a safe limit. The open vented lead acid 2 volt cells are the most appropriate solar batteries (also called tubular). They normally have a long life and very high cycle capability at fairly deep discharges. Good brands only need to have the water filled every three years or so. The lifespan of these batteries can be 10 years or more. These batteries are normally available from 2V / 200Ah cells up to 2V / 3000Ah cells. They are very suitable for medium and large installations. The same batteries are also available in a completely sealed format and are therefore more expensive. These sealed cells are mainly used for remote solar applications like telecommunication and cell phone stations but can also be used in private applications. Batteries can be connected in either series or parallel. By connecting the batteries in series you will increase the voltage without affecting or increasing the amps. Series connections is where the positive terminal of one battery is connected to the negative terminal of another. Parallel wiring refers to connecting batteries to increase amps, but not volts. The positive terminal of one battery is connected to the positive terminal of the other, and the same with the negative terminal. 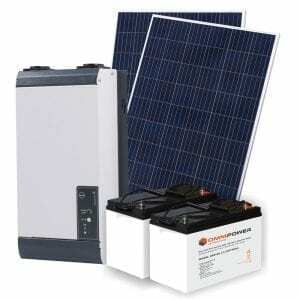 Inverters are rated in continuous wattage and surge watts. Continuous watts are the total watts the inverter can support indefinitely. So a 3000 watt inverter can supply power up to 3000 watts continuously. Surge watts are how much power the inverter can support for a very brief period, usually the watts needed when the connected equipment starts up. So a 3000 watt inverter rated at 4500 surge watts can handle up to 4500 watts momentarily while starting such loads. 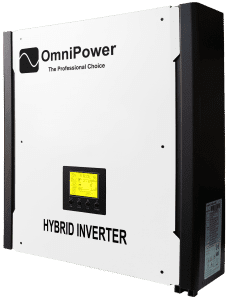 It is definitely an advantage to choose inverters with very high inrush or start up capabilities; this often results in using a smaller inverter. The Studer and Outback inverter series have an inrush capability of 3 times the rated continuous watts. 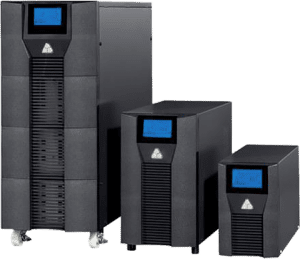 A 3000W inverter can start loads with 9000 watts startup requirements. Click here to find out how to choose an inverter. The MPPT Charge controllers from Outback Power Products (FM60 and FM80) can charge, for example, a 12 or 24 volt battery from a 48 volt solar array. With these, power systems of any battery voltage can reach longer distances to place solar modules in the best sun location. The MPPT (Maximum Power Point Tracking) can produce up to 30 % more yield from your solar array, this means for the same power output less solar panels. 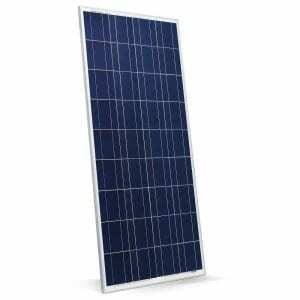 If you can, start with enough solar modules required to do the job, since this is where most of your power originates. If your budget allows, perhaps start with half or a third of the panels and add the rest in subsequent years. 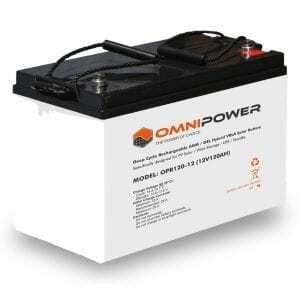 This will help avoid battery problems and save many generator hours. Solar charging is what made home power systems practical! Solar power is modular. When the family grows, you can add more solar modules. Consider your long term objective in making these decisions.